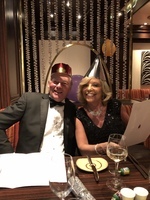 We chose this cruise been a new year cruise. Have been on the Azura 8 times but there will not be a 9th. Xmas decorations were beautifully done. There seemed to many people on the ship. People everywhere inside and out. The service on board was dreadful waiters just couldn’t be bothered, plus they were overworked. Never ever have I seen people in dining room in shorts above the knee, Tracksuit joggers and trainers. No one including maitred said a word. I always thought it was a smart casual dress code . See days were manic. We sat in the so called quiet adult area. If you hadn’t got a subbed by 8.15 forget it. They got more Sun beds out from somewhere, put them wherever they could. Not even the poor bar waiters could get by to take drink orders. We were sandwiched in like sardines. New year’s eve I must say was amazing great entertainment great atmosphere. But unfortunately we had 12 other days to put up with on this holiday camp ship. We were put in Sindu ( Indian restaurant) for our N Y gala meal , I did complain but they were having none of it. They did compromise and let us join my son and daughter. Yes they pus us in different restaurants at different times, even though we shared the same cabin. In hignsite we’re please we were in Sindu as we got fab service with pleasant waiters. Cheese & biscuit were a joke . I will try and put a photo on later. We heard people moaning that they were waiting 30 mins between corses. And there drinks just didn’t arrive. Entertainment was ok . Astonishing show done by head liners was very good even though we have seen it many times. We chose this cruise been a new year cruise. Have been on the Azura 8 times but there will not be a 9th. Xmas decorations were beautifully done. There seemed to many people on the ship. People everywhere inside and out. The service on board was dreadful waiters just couldn’t be bothered, plus they were overworked. Never ever have I seen people in dining room in shorts above the knee, Tracksuit joggers and trainers. No one including maitred said a word. I always thought it was a smart casual dress code . See days were manic. We sat in the so called quiet adult area. If you hadn’t got a subbed by 8.15 forget it. They got more Sun beds out from somewhere, put them wherever they could. Not even the poor bar waiters could get by to take drink orders. We were sandwiched in like sardines. New year’s eve I must say was amazing great entertainment great atmosphere. But unfortunately we had 12 other days to put up with on this holiday camp ship. We were put in Sindu ( Indian restaurant) for our N Y gala meal , I did complain but they were having none of it. They did compromise and let us join my son and daughter. Yes they pus us in different restaurants at different times, even though we shared the same cabin. In hignsite we’re please we were in Sindu as we got fab service with pleasant waiters. 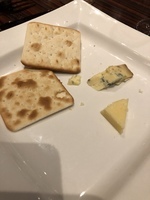 Cheese & biscuit were a joke . I will try and put a photo on later. We heard people moaning that they were waiting 30 mins between corses. And there drinks just didn’t arrive. Entertainment was ok . Astonishing show done by head liners was very good even though we have seen it many times.